Contains fun and challenging puzzles your group must solve before your time runs out! Clues are tricky, but no special skills or knowledge is required. It is a perfect team-building activity because everyone must work together to escape from the room. If you are late you may have to wait 30 mins for the next available game. It is the policy of Escape Hotel that anyone under the age of 18 will not be allowed to participate at the Event unless accompanied by a parent or guardian as more fully set forth below. If any participant is between the ages of eighteen (18) and fourteen (14) (a “Teenager”), such Teenager must obtain written consent from a parent or legal guardian to attend the Event and/or to use Escape Hotel’s facilities. If any participant is fourteen (14) years of age or younger (a “Minor”), a parent or legal guardian must provide written consent and accompany the Minor always during the Event. In the event any liability arises, directly or indirectly, as a result of a Teenager’s or Minor’s actions or omissions, including but not limited to, any injuries (including personal injury, disability, dismemberment and death), illness, losses, damages, claims, liabilities, costs or expenses of any kind or nature, then the Teenager’s or Minor’s parent and/or legal guardian shall be vicariously liable for any and all such liability. If any Teenager or Minor fails to comply with Escape Hotel’s reasonable requests during the Event or anywhere on Escape Hotel’s premises, then Escape Hotel and its authorized representatives reserve the right to terminate the Event without refund. No person four (4) years of age or younger shall be permitted to participate in the Event and/or use Escape Hotel’s facilities. Escape Hotel, is quite an unusual venue. To begin with, it is the largest, live, escape venue in the world! From the very moment you step through the doors of Escape Hotel, you’ll become aware of how the lovely establishment is unlike any “hotel” you’ve ever visited! 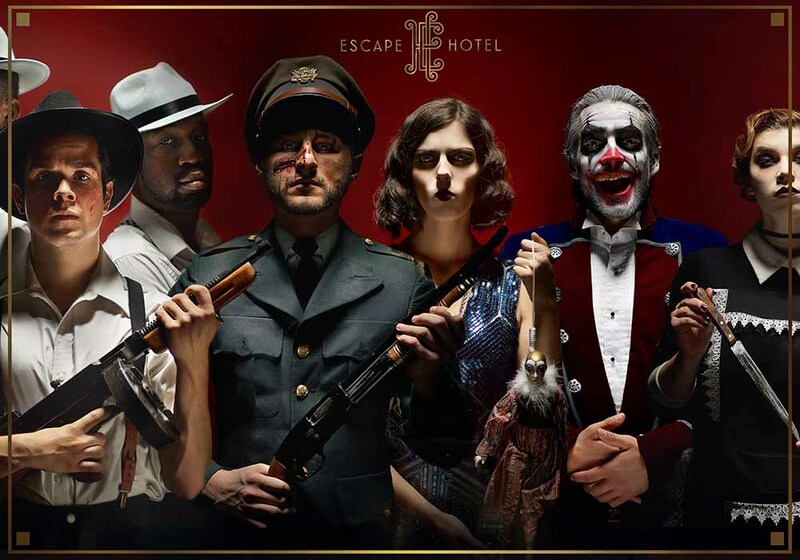 Escape Hotel Hollywood games are live-action adventures where you enter with a team to race and solve clues, puzzles and try your best to escape before your time runs out. Perhaps you’d like to start your visit at our Devour Bar and claim for yourself, one of our sinfully decadent and delicious, had crafted delights. Or you may wish to deplete some of your “finite life energy” and indulge yourself at one or more of our extraordinary table games. And of course. For those who re brave to actually “check in,” you will treat yourself to one of the most unique, exquisite and unforgettable experiences of your life! Finally, our beloved room service staff, on occasion, will need to visit a suite, if our guests do not wish to check out on time. You seem only 60-minutes separates you from the same ill-fated end, our previous guests of the hotel, unfortunately experienced. These are live-action events. You must arrive and check in at least 30-minutes prior to the start of the Program. If you cancel within 24 hours of the start of the Program, you will not be eligible for a refund of the Fees, but Escape Hotel may, in its sole discretion and based upon availability, reschedule the Program. Weekends during the evening are the busiest times. Wednesdays and Thursdays are the least busy during the week. *Fun Fact* all the employees are in costume and in character which adds fun and ambience. Bonus: There’s a café with food and drinks!